So the year's final major starts today at Medinah, where Tiger outlasted Sergio in 1999 to win his first PGA title. The course this year is the longest in major championship history, measuring out ant an insane 7,561 yards. Par is 72, which means that Tiger is a 50/50 shot to win, but the par5s are not reachable like they were at the British Open. It looks like only 2 of them will be reachable in two, and just barely at that. Each year at the PGA the players are paired in groups of 3 for the first 2 rounds. 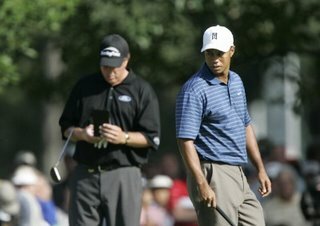 Traditionally the 3 winners of the year's first 3 majors are paired together; this year that means Tiger, Phil, and Geoff Oglivy. That in itself will be interesting to watch, because it is always fun to watch Tiger & Phil try to pretend that they don't hate each other. The best example of this was when they were paired together as teammates in a Ryder Cup Fourball match and they barely spoke to each other for 18 holes; it was no suprise that they lost the match even though they were #1 & #2 in the world at the time. their contempt for each other. The other interesting thing about the PGA is that Ryder Cup spots are on the line, and a couple of guys will play themselves onto or off the teams this week. The PGA has a tendency to produce out of nowhere champions (Shaun Micheel, Rich Beem) or have giants of the game win (Phil, Tiger, Vijay). So who will win this week? I have Tiger against the field at 3-1 odds in my ongoing bet with SD, and since he is 9 for 17 on par 72 majors the odds of the bet are actually in my favor. So let's say either Tiger wins or someone out of nowhere wins. Also, my condolences go out to one of my favorite golfers, Darren Clarke, and his family after his wife Heather lost her 2 year battle with breast cancer last weekend. If you are stuck in a cubicle today and tomorrow you can follow all of the action here. Also, you can find The Golf Channel's coverage here. Enjoy. Tiger, Phil, and Oglive all shot 3 under 69 and are currently tied for 7th. Lucas Glover leads at 6 under after shooting 66. The par5s are more reachable than I thought they would be. They just said on TNT that Tiger has won the last 6 majors where he shot in the 60s in his 1st round, which of course means exactly nothing.